My kids for Halloween. 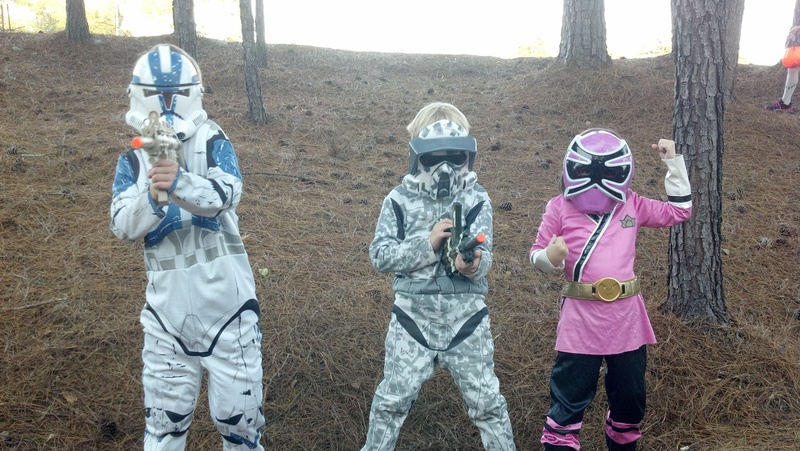 Two Clone Troopers and a Pink Power Ranger Samurai Ninja Princess. Back away from the candy and nobody gets hurt! You’re not going to see many pictures of my kids on this blog. But last night, they were all so absolutely perfect for Halloween, I just had to share their costumes. They seemed so apropos. While all the little girls at my daughter’s school spilled out of their moms’ minivans wearing flouncy princess and fairy costumes, my daughter balled up her fists and struck a martial arts pose – pretty in pink, but she wasn’t going to take any guff off anyone. My boys worked the Clone Warrior costumes. Between houses, they dove into ditches and scanned the roadway for bad guys. They advanced on houses like the Allies taking the beaches at Normandy, complete with hand signals and shouted battle commands. In short, my kids’ costumes are exactly what I would have expected of them. They are all adventurers at heart.